When the Silicon Valley Moms blog selected me for a $200 Staples shopping spree, I thanked them and politely declined, saying we didn't really need anything from Staples. Joke!!! Are you kidding me ???? I snatched that giftcard and wrote my name on it in permanent marker and coughed on it and peed around it in a circle to make sure everyone knew that Staples giftcard was mine, all mine. I could think of a million cool things Staples sells that I could spend that $200 on..... a wireless printer.... an iPod nano... half a netbook.... a digital camera.... a digital photo frame.... The possibilities were endless. The problem is, I'm kind of a cheapskate. 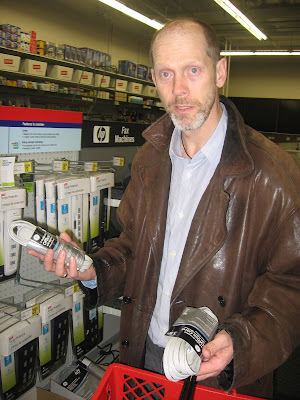 I knew I'd end up spending it on printer paper and toner and cartridge and all the practical stuff that we need. Not a very exciting shopping spree, huh. So I decided to give the giftcard to Alfie as a present. 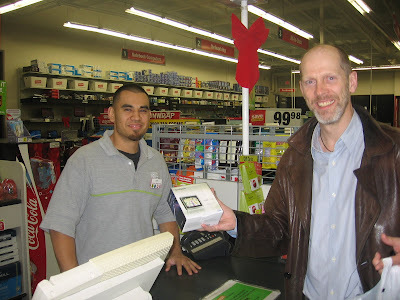 I told him he had complete say in how to spend the $200; I would not interfere (okay, I did try and put in a few good words for a Canon Powershot camera), and all he had to do was let me take his photo and blog about the experience. Imagine my disappointment when the first thing he reached for was an extension cord. Then a power surge strip. Then a compressed-air canister for blowing dust out of keyboards. I tried to point out the iPod docking stations. The ergonomic office chairs. The iPod Touch. But he only had eyes for the HDMI cable (okay, that one isn't an everyday purchase, but it's certainly a geeky one. 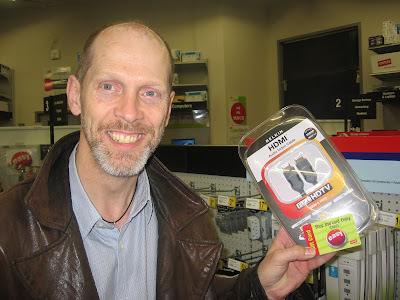 I don't want to blog about how I got my husband a video cable for a present!). Er.....no, Alfie. That's not what you buy on a shopping spree, that's what you buy on an errand! I could have done that myself and stocked up on printer ink! Now is not the time to be practical! My resolve to not interfere was sorely tested. I was beginning to wish I had just gone to Staples myself and bought him a Sony digital reader. Now that's a present. Then we moved to the GPS aisle. And that is where he found the perfect present. Alfie is absolutely hopeless when it comes to directions; he can barely find his way around the block. He bought his car in 1996 and his motorcycle in 2002, when installed GPS systems weren't common yet. When we bought our minivan in 2004, we decided not to spend the extra money to get a GPS system since I happen to be good at directions and I'd be driving the minivan most of the time. So whenever Alfie goes anywhere without me, he prints pages and pages of maps and directions. Which is why a portable GPS is exactly what he needs. 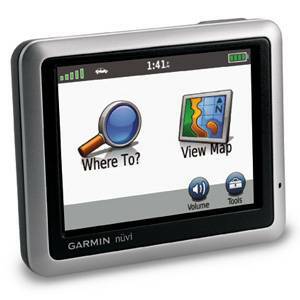 Alfie's perfect present, the Garmin Nuvo 1200, was just $169.99. We also decided to get the Staples Technical Support & Protection Plan since we'd get full protection for damages and defects for 2 years, as well as a guaranteed one-time replacement (basically, Staples would issue us a $169.99 credit towards the purchase of a new GPS) within the next 2 years. We ended up buying all the other stuff that Alfie had picked up, because it was something we needed anyway, but I'm so happy that we were able to find a practical present for just over $200 (with the protection plan), with major coolness points! Alfie was so happy with his present, and so was I! Thanks Staples! 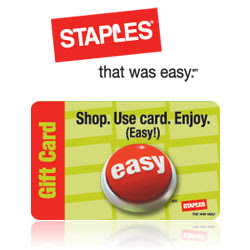 I received a $200 Staples gift card and used it to review the shopping experience at Staples. The views and opinions expressed here are my own. Brim over I to but I about the list inform should acquire more info then it has. Win a Jillian Michaels Wii Fit Package! Ragu $100 giveaway ends tomorrow! See a movie tonight, free! Last Day to Enter the Cheer detergent giveaway!